After puddings and desserts, my favourite things to eat are little savoury nibbles. The first thing I do at a party is to sidle over to the food and check out the appetizers/hors'doeuvres/cocktail bites/canapes or whatever you want to call them. Then I usually make a mental note of my favourites to make at home. The simple ones are usually the most popular - which is good because you can make a ton of them to satisfy your guests. These little crostini were made from day-old French bread, which was sliced, and the slices were then cut in half again. Brush them with olive oil and crushed garlic, then grill them on both sides until golden. 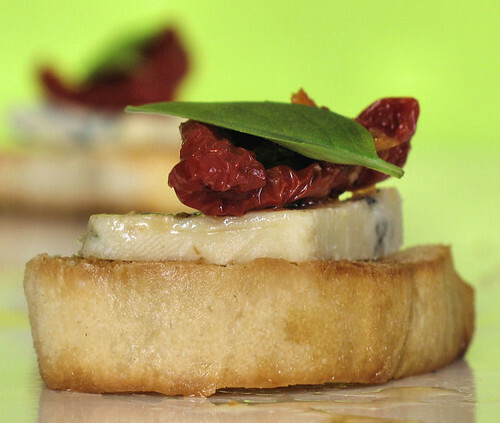 Slice or crumble your choice of blue cheese on the top, add a sun dried tomato and a basil leaf. I like the tomatoes that come in the olive oil with herbs. My crostini nibbles are off to a party, being hosted by Mansi Desai from Fun and Food. It's the monthly mingle, an event started by Meeta from What's For Lunch Honey? 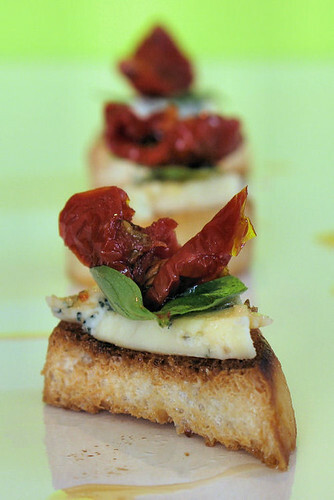 The theme for this month, if you hadn't guessed by now, is Appetizers & Hors'Doeuvres! Oooh now they look good! I love things like that - savoury nibbly bits. Mmmmmmmmmmm . ...Now, that looks great! nibbles...i could live on nibbles. damn my husband, who is convinced that nibbles do not a meal make. what beautiful crostini...I have all of this in my house. I wonder if it is allowed to make some for a midnight snack? Delicious and like always, such appetizing photography! Simple and delicious. And yes, those sun dried tomatoes are great. Those look good and sound really tasty! The combination is great - the colours are great - the first picture even looks like an eagle in flight. Passionate baker - thank you! Bet they would be even better with your home-made sun dried tomatoes. Jan - I love 'em too! Grace - most things with sun dried toms are delicious! Mansi - I didn't use pears but I think they would be pretty good too! Patricia - it's a good combo, thank you! Michelle - there's always one that has to spoil things, lol! Ronell - thank you and yes, a midnight snack is definitely allowed! Giz - an eagle? I think you've had too much cheese, lol, or I must be looking at a different pic! I hope this platter is FULL, because I will eat quite a few myself. Blue cheese in any form, is right up my alley!!! Oh, swoon - we could so eat together. I love small bites - i.e., tapas or whatnot. But slap on some garlic and blue cheese and sun dried tomato? I'm IN! Great combo here. Plus, adorable. Crostinis are the perfect party food! I almost always make one for a party I'm throwing! These look delicious! I love sun dried tomatoes, and cheese, and bread, so these are perfect for me! Your photos are just stunning! Whatever you make just jumps off the screen. What a talent! I love the nibbles best too. That way, I get to try more different foods. Your crostini look delicious. I would choose a creamy gorgonzola! Simple and delicious! Great post. Your pictures are gorgeous! Crostini is one of our go-to dinners in the summer. Your flavor combination really makes those crostini sing! I wish I could eat one of those 'horses douvres'!!! That's what I used to call them when I was a child. The flavour combo is perfect and the photo stunning - as ever. They may be small in size, but they look big in taste! Plus they're just so pretty. i'm likin the way that blue cheese is looking at me. Hi there Nic...am back again; have tagged you & it's not a bad one!! Cheers girl!! This looks so good - my mouth is watering! YUM! Oh, how lovely! I adore nibbles too - but for some reason I seldom make them. One quick tecchi question - what camera & lens are you using? I love your use of DOF! Many thanks for all the super comments! Deeba - thanks for the tag (not!) lol, you bad girl!!! And Valli - I'll try and do it soon! I love the little tomato butterfly! I just wanted to reach out and grab it!